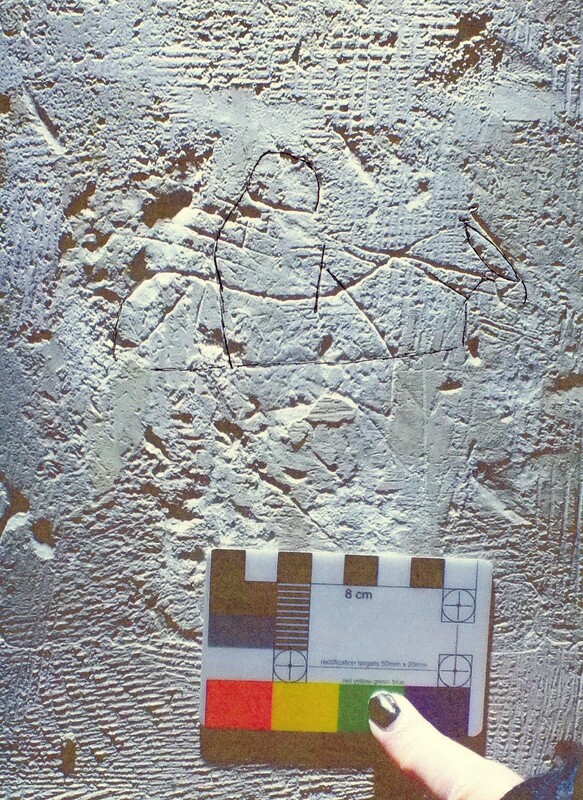 In December 2016 the Kent Medieval Graffiti Survey (KMGS) surveyed the church of St Mary the Virgin, Stone near Dartford. Tucked away down a lane, off what used to be the main A2 road and now surrounded by modern housing developments is the lovely old church of St Mary. 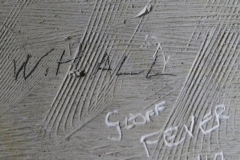 This church is one where we have been fortunate, in that Victorian and other church “restorers” either ignored or failed to notice much of the graffiti. The chancel arcade which was built around 1260, it is believed to be by the same masons who built the Choir Chapel of Westminster Abbey. 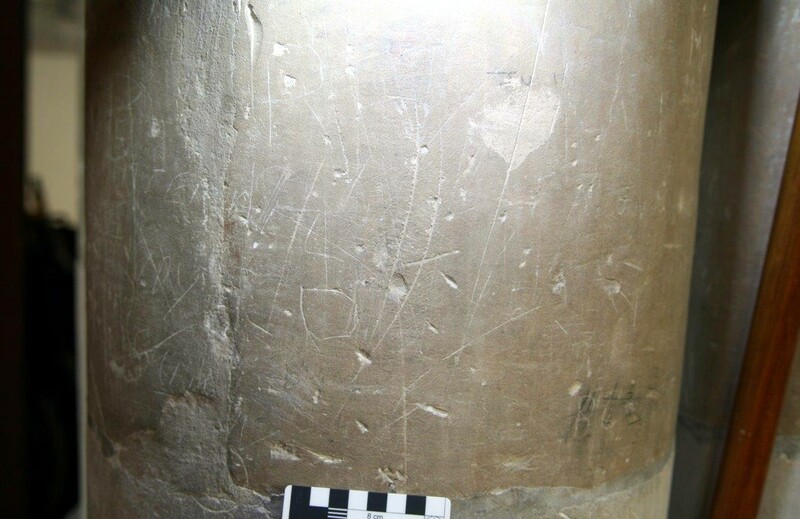 Much of the original nave is extant and contains a reasonable amount of graffiti. 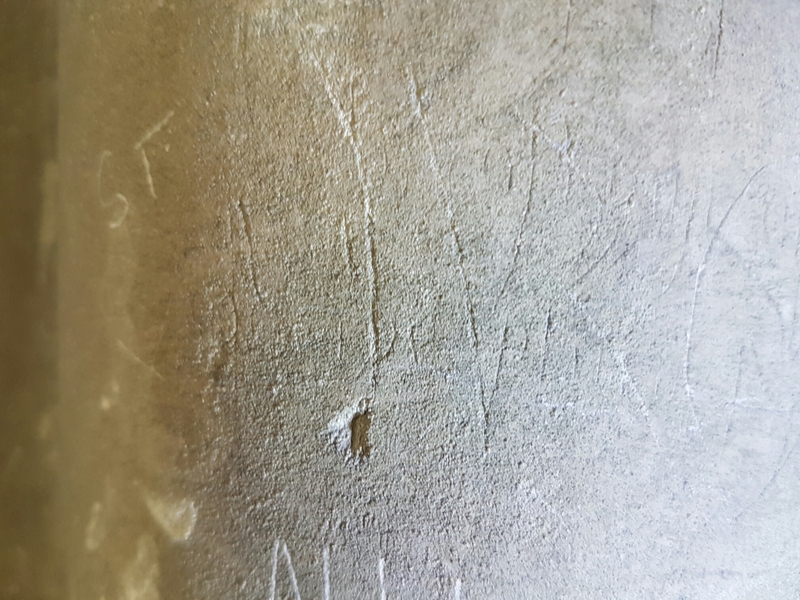 While the nave contains a wide variety of graffiti, none was found in the chancel apart from the pillars of the chancel arch. 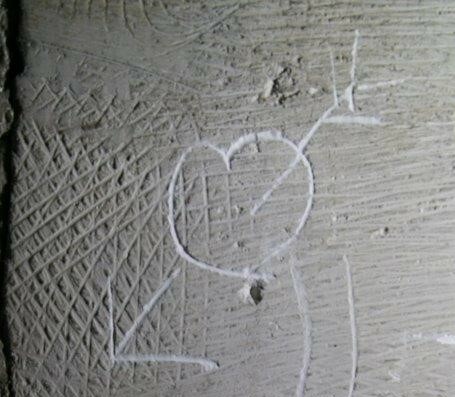 The later, early 14th century, tower also contains a fine assemblage of graffiti. 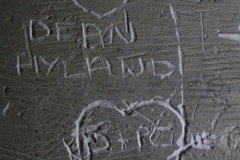 The graffiti is varied in age, type, style, quality and location. 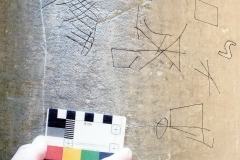 There are animals, mesh marks, arrows, compass drawn designs, crosses, heraldic, a possible merchant mark, an architectural, Marian marks, script, hearts and a variety of modern names, initials and dates. 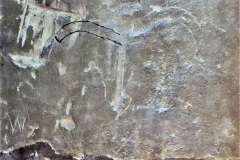 It is difficult to date graffiti, some, such as the lion, could be almost as old as the church. 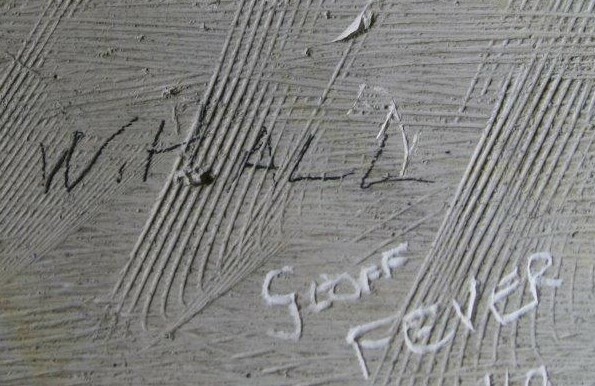 No real attempt has been made to date the graffiti, however some has been described as modern. The word modern covers a range from the mid-16th century to the present day, although at times pieces that are thought to date from the earliest part of this period have been referred to as post-medieval and the odd piece as late medieval. These inscriptions have been put into groups as seem appropriate. That compass drawn designs have been placed in three groups may seem strange but this is because of the probable reason they were drawn. Concentric and overlapping circles are usually thought to be apotropaic and are thus classed as this. 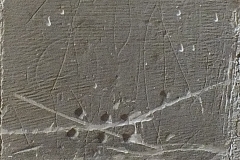 Some plain circles that are possibly post-reformation, if not later, were also placed under compass drawn designs. 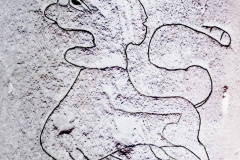 However, one or two single circles, believed to earlier have been classed as apotropaic. While compass drawn crosses have been placed under compass drawn designs, rather than crosses. 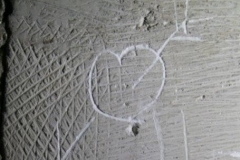 A section on hearts has been included, largely because although only a small number were found, usually only the odd one, if any, are found in a church. 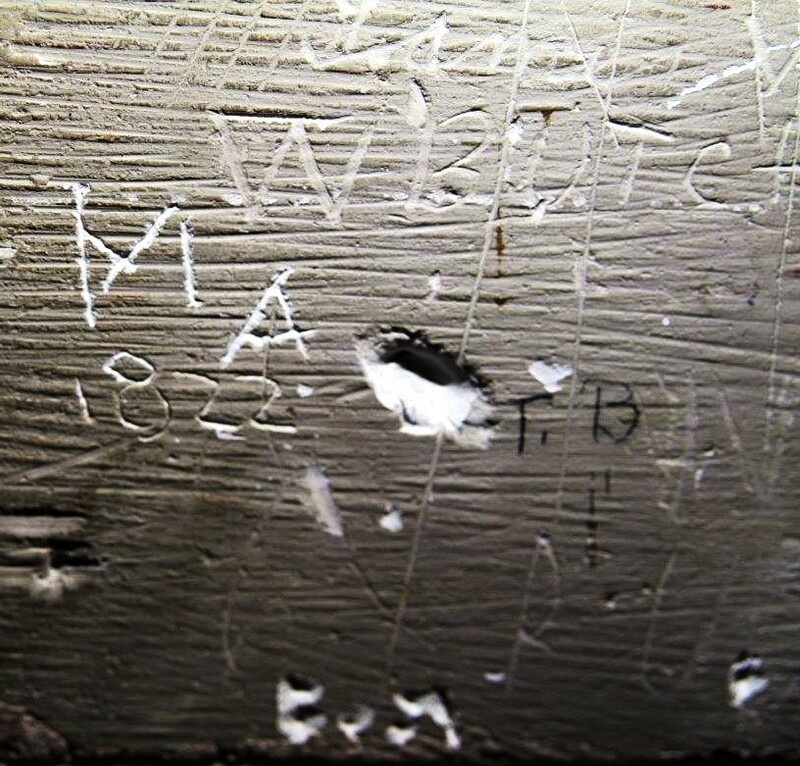 A relatively large amount of graffiti was found which were either unidentified or might fit into more than one category, because of this a section on unknown or ambiguous graffiti has been included. Most of the photos used here were taken by or with the help of the KMGS volunteers. Unfortunately, as this was a group effort, I do not know who helped take each photo but they will know when they see them and they all have my thanks. One final point in a number of photographs the rectification card can be seen held to the wall by White Tack. Unlike Blue Tack this material does not leave an oily mark on masonry and if used with a little thought will not damage friable stone. The ban on Blue Tack only filtered down to those of us who conduct surveys while they were working on this church. This led to the design and first use of the Anstee Rectification Card Holder MK I. Images of three animals were discovered in this church. A lion (AN01) is almost certainly medieval, possibly dating from the early days of the building, at a guess late 13th or early 14th century was found. This is on the west side of the eastern pillar of the north arcade. 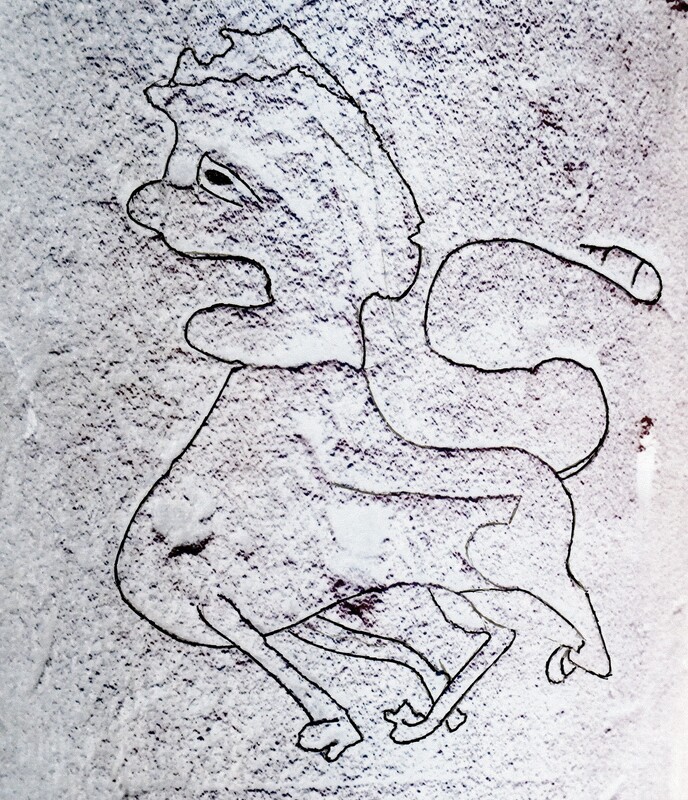 On the south face of the square pillar of the south arcade, is a partly erased or eroded horse (AN03), also partly obscured by filler. This is ridden by a rather crude figure of a rider, which seems later than the horse. 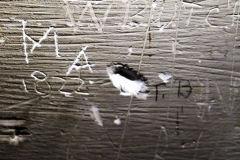 On the wall of the tower stair case is a graffito that was hard to identify (AN05). 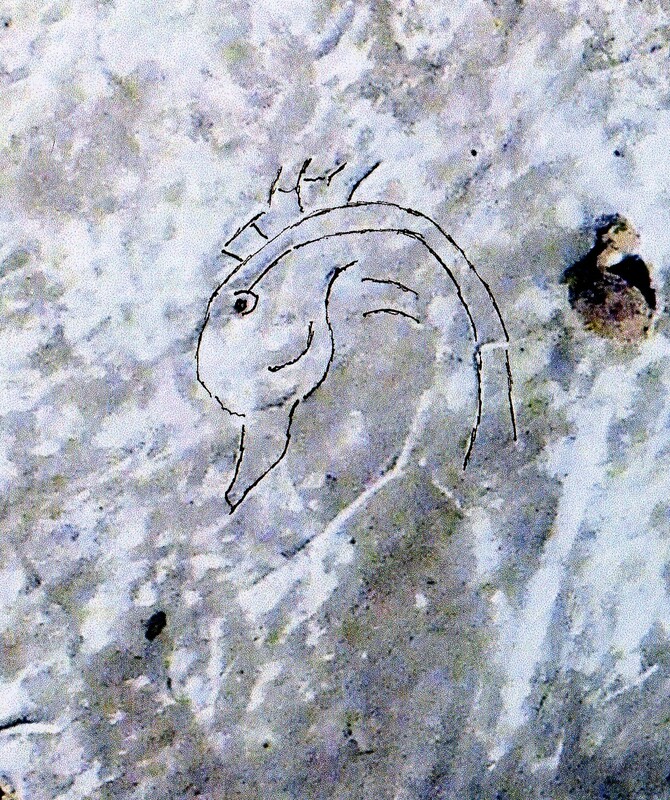 Other opinions were asked on this graffito, which brought two main may responses, the head and neck of a swan or possibly a dolphin. After enhancing the photo (AN06) it seemed to bear more of a resemblance to a dolphin, as seen in the Bestiary MS Bodley 764, than a swan. However, readers can make up their own mind. 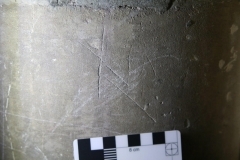 AN01) North aisle east pillar. A lion. AN3) South aisle aectangular Pallar south face. A horse largely removed or covered with filler. AN5) Lower section of tower stairs wall. Either a dolphin or a swan's head & neck. 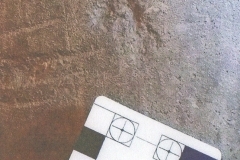 At least twenty apotropaic marks, plus a number that may be protective marks were found. 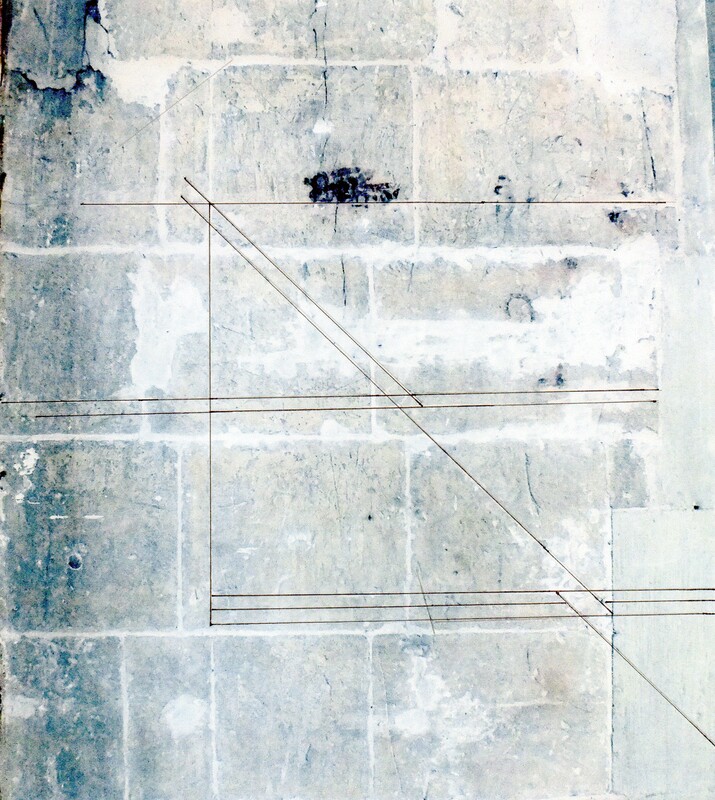 These include, a ladder mark, compass drawn designs, VVs, mesh marks, an ellipse, various geometric shapes, intersecting and crossing lines. In many ways it is difficult to be certain that an inscription is apotropaic. A good example of this is AP13, this is what seems to be a chisel cut ellipse. Usually chisel cut designs are attributed to stone masons, however curved mason’s marks are very rare. 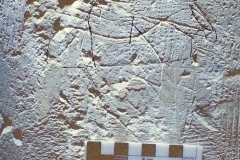 I have only seen two mason’s marks with curves or arcs of circles. For this reason AP13 is believed to be an apotropaic mark. P01) North aisle 2nd pillar from the east. At least five concentric circles. AP02) Same pillar as AP01. Two joined rough triangles. AP03) North aisle rectangular pillar north face. 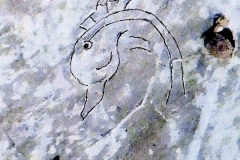 Possibly a partly crossed out VV or a letter A.
AP04) Near AP3. Possibly a VV on its side. AP05) Same pillar as No 3. 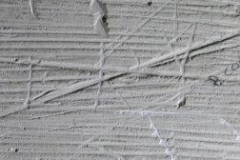 A mesh and other marks. AP07) Near AP5. A roughly shield shapped mesh. AP08} Near AP6. A vaguely fish-shaped mesh. AP10) The same pillar as AP8. A grill shape. AP11) The same pillar as AP3-10. Five or six concentric circles. AP12) North aisle rectangular pillar north west corner. Odd scratched lines. AP13) South rectangular pillar, east end. An ellipse which may be chisel cut. AP14) Near AP13. A rectangle with a line through it. AP15) Near AP13 on circular column. Four intersecting lines. AP16) South rectangular pillar south face. Two concentric circles. AP17) South rectangular pillar, west column. A mesh. AP18) South rectangular pillar east end. A small circle. AP19) South rectangular pillar, north side west end. 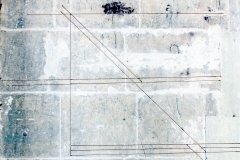 An incomplete or partly erased compass drawn design. AP20) Chancel arch north west end column. A long mesh. AP21) Chancel arch south side north east face. A circle. AP22) Ringing chamber door north side. In badly damaged masonry a VV. AP23) Tower stairs below the bell chamber. 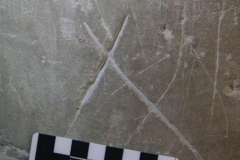 A ladder mark. AP24) Tower stairs near the bell chamber door. A mesh mark. AP25) Tower stairs mid section. crossed lines. AP26) Tower stairs lower section. 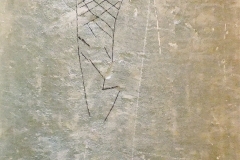 A Marian mark. AP27) Tower stairs lower section. Crossing lines. AP28) Tower stairs top section. Two mesh marks. AP29) Tower stairs mid-section. A Marian mark. AP30) Tower stairs mid-section. A VV. AP31) Chancel south wall, centre window sill. Various crossed lines. Five arrows were found, exactly what their purpose is the author has no real idea. Given that they are found, albeit only in ones and twos, in many churches, they must have had a purpose. 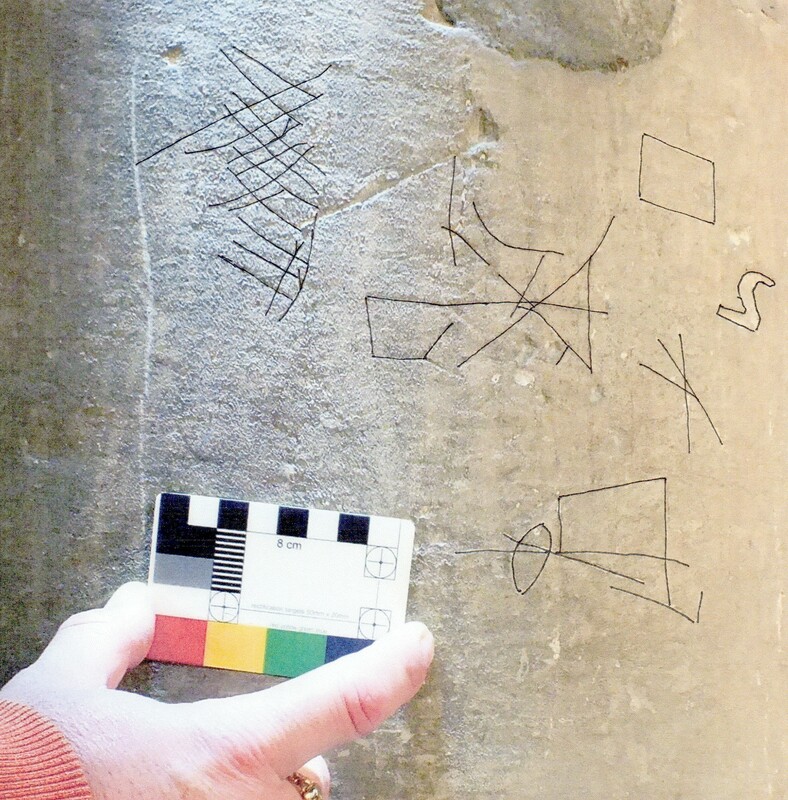 Possibly they are apotropaic, perhaps similar to the intersecting lines which were believed to trap evil entities; but this is little more than a guess. AR01) North aisle, 2nd pillar from east, west side. An arrow. AR03) North rectangular pillar, west end south side. Three arrows. AR04) North rectangular pillar, west end column. Two arrows. AR05) South aisle 1st pillar east of rectangular pillar. 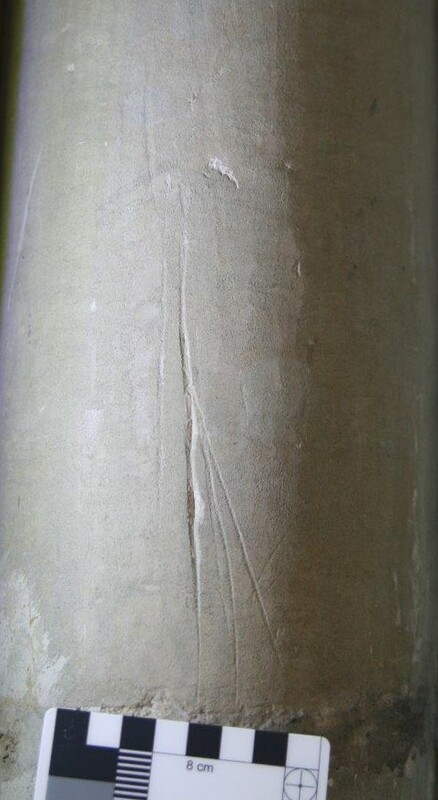 An arrow on base of pillar. This group consists of what are thought to be relatively modern compass drawn circles, so are unlikely to be apotropaic, there are six of these. There are two compass drawn crosses (CD03 & CD04) and there are four groups of three interlocked circles. These latter (CD08 to CD11) have been seen in other churches but as tomb decorations not graffiti on walls. Again it is not known with certainty what their purpose was but given that they are found mainly on tombs, they may be apotropaic. 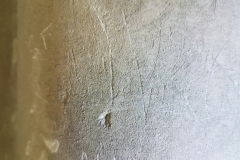 CD01) North aisle east pillar. Two modern-looking circles. CD02) Pillar west of CD1. A circle. CD03) North rectangular pillar. A small compass drawn cross. 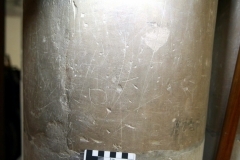 CD04) North rectangular pillar. A compass drawn cross. CD05) North rectangular pillar. A compass drawn circle. CD06) Tower stair upper level. A compass drawn design, possibly the start of a cross or daisy wheel. CD07) Tower stair 1st window. A compass drawn circle. CD08) Tower stair upper section. A compass drawn design of 3 circles. CD09) Near CD8. The same design. CD10) The same design again near CD8. CD11) The last of these 3 circle designs, near CD8. 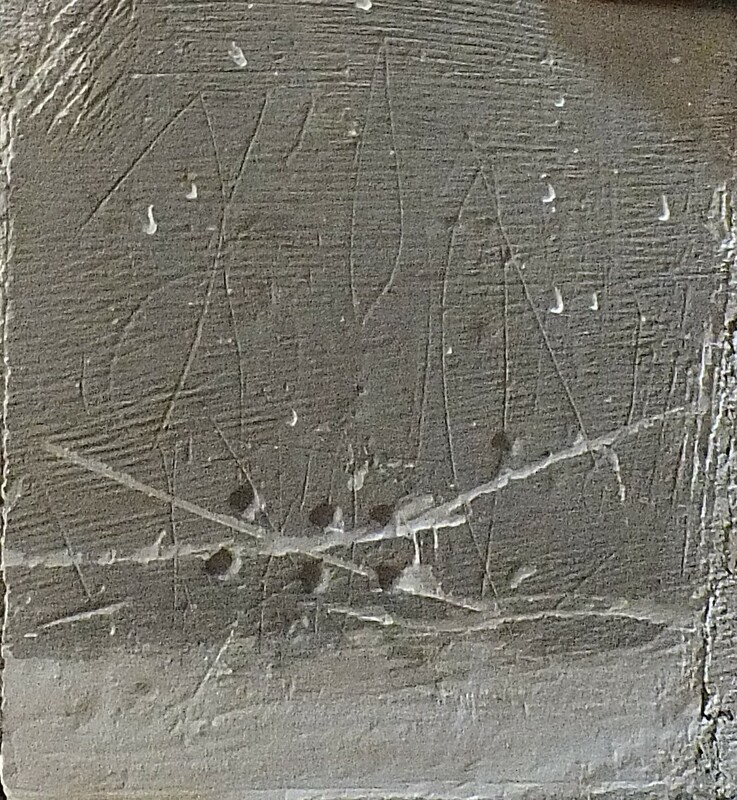 There are over twenty crosses, mainly quite simple and rather crude but one or two are a little better than the rest. A number are also rather faint and difficult to see. These are probably votive in nature but again there is no real proof of this. If they were located around the main doorway then they might well have been placed there to mark an agreement. 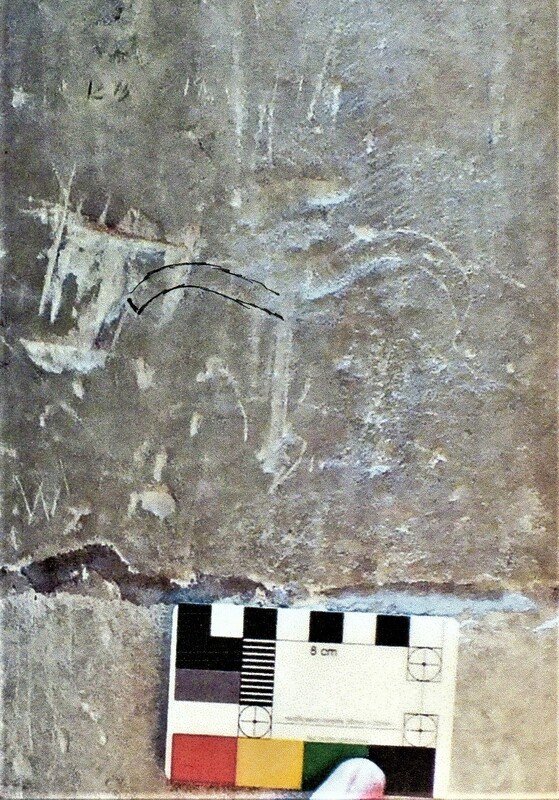 C01) North aisle east pillar, north side. A faint cross. 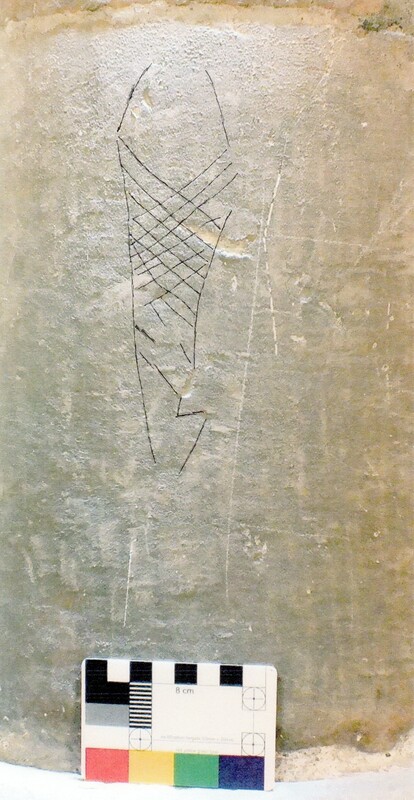 C02) North aisle east pillar, east side. A faint cross. C03) North rectangular pillar, north side. A rough St Andrew's cross. C04) North rectangular pillar, north side. Two small St Andrew's crosses. 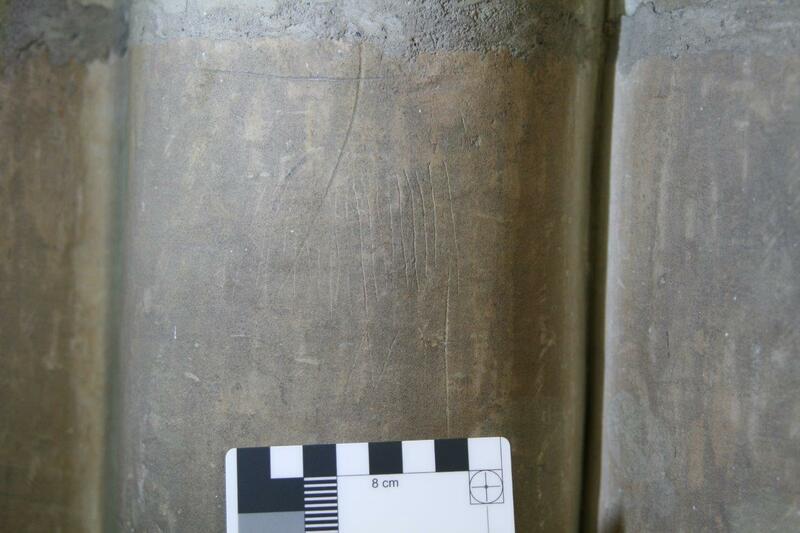 C05) North rectangular pillar, west end. A St Andrew's cross. C06) North rectangular pillar, south west side. A St Andrew's cross. C07) North rectangular pillar, south side. A very small cross that has been gone over in pencil. C08) South rectangular pillar, south eastern column. Possibly a cross. C09) South rectangular pillar, north west column. Possibly the remains of a cross. C10) South rectangular pillar, south west corner. A rough cross. C11) Near C10. St A rough St Andrew's cross. C12) North chancel arch, north face. A cross. C13) North chancel arch, south face. Two crosses. C14) North chancel arch, south face. Two more crosses. C15) North chancel west circular column. A St Andrew's cross. C16) North chancel arch, west wnd circular column. A cross. C17) Tower stairs lower section. Arough St Andrew's cross. C18) Nave south wall, east of east window. A possible cross. There are four hearts, these are modern and seem to relate to relationships. It is assumed that the arrows which pierce two of them represents Cupid’s Arrow. H01) North rectangular pillar, north side. A heart with arrow through it. H02) Near H1. Two hearts, one with arrow through it. H03) Near H1. A heart with initials. 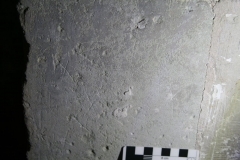 One human face in profile (HU01), which appears to be modern, was found on the wall of the Tower Stair. 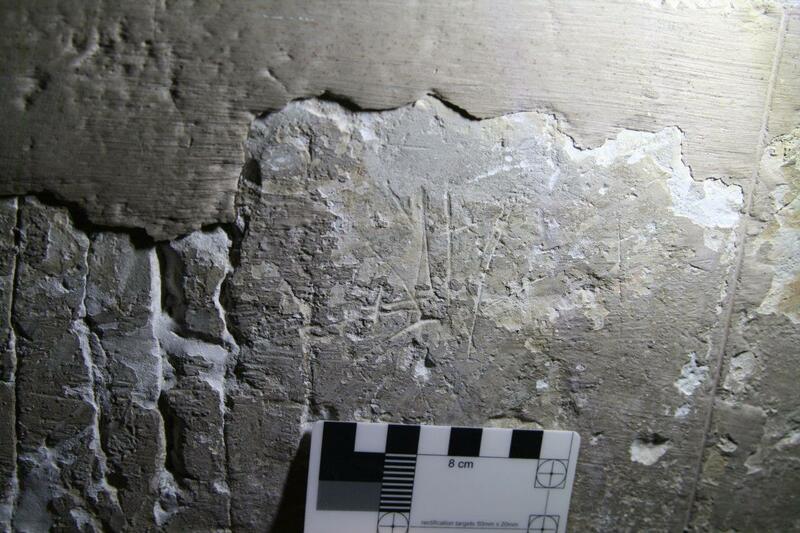 Also on this wall but higher up was what seems to be a late medieval figure of a man (HU02), possibly holding a spear. HU01) Tower stairs near the bottom. A human head. HU02) Tower stairs, near the top. The figure of a man. 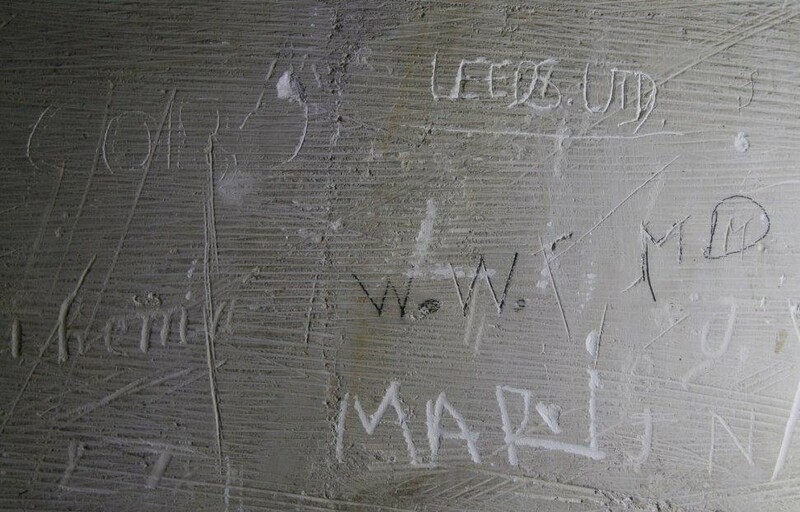 There is a very large amount of modern graffiti, largely on the rectangular pillar of the north arcade and the wall of the Tower Stairs. Those that are dated are mainly 18th, 19th and 20th century, however one damaged specimen seems to read “1601” (Fig M34), making it early 17th century. 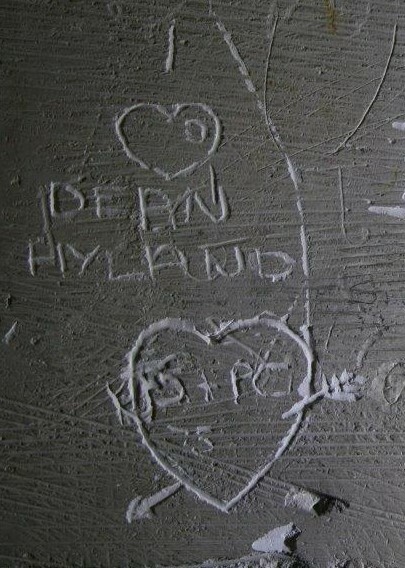 Even this modern graffiti can be damaged or partly removed as in Fig M32. 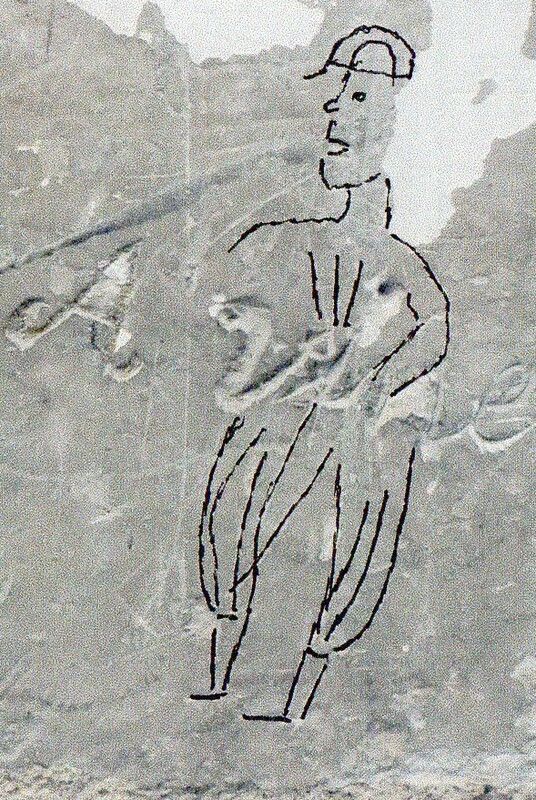 Some earlier graffiti seems to have been incorporated into the modern. For example, Fig M12 where a “G” seems to have been added to a “VV” or at least an earlier “W”. 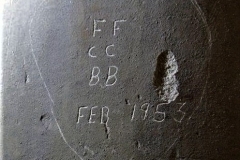 While modern graffiti has at times been inscribed over the old, see Fig M35. These initials and letters can be small as in Fig M38, which is less than 1 cm square. M01) North rectangular pillar, north pillar. Two names. M02) Near M01. Names & dates. M03) Near M01. 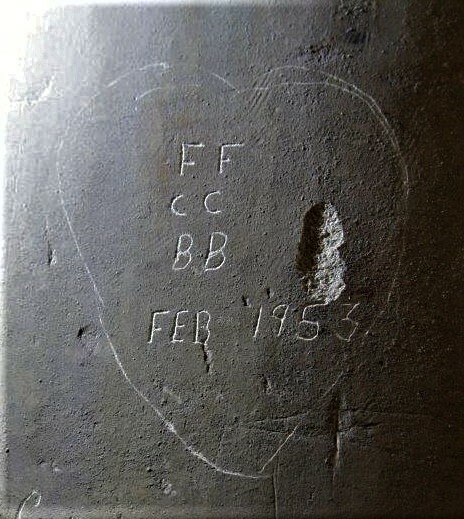 Initials & dates. M04) Near M01. Leeds Utd etc. M05) Near M01. W BUTCH etc. M06) South rectangular pillar, south face. Initials. M07) Near M06. A name, possibly James Parn. M08) Near M06. An odd piece of text. M09) Same side as M06. Initials GS. M10) Organ panel north door. Name H. HULL. M11) Organ panel west end. A name obscured by gloss paint. M12) Bell chamber doorway, north side. 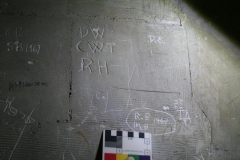 Initials CW, they look to have been done at different times. The W may in fact be VV. M14) Ringing chamber, deep inside the east window. M. Murray 11 Jan 1881 in pencil. M15) Ringing chamber south window, east side. Initials CL. M16) Ringing chamber south window, west side. Initials CL or CC. M17) Ringing chamber north west window, south side. M.
M18) Ringing chamber doorway, west side. Initials GI, letters H & I.
M19) Ringing chamber, east wall. FGB 1862. M20) Tower stairs mid-section. Possible memorials. TF 1706. M21) Tower stairs mid-section. A damaged possible memorial perhaps JW 1641. M22) Tower stairs mid-section. Initials IB & FT.
M23) Tower stairs mid-section. Initials possibly LCB. M25) Tower stairs mid-section. Various initials. M26) Tower stairs top section. Initials possibly RN. M27) Tower stairs mid-section. Reversed R and a B.
er section. F. Thoragood 1871 & A. Outred 1871 etc. M29) Tower stairs upper section. Various initials. M30) Tower stairs mid-section under the tread PENNY RIMBAUD. M31) Tower stairs mid-section. Initials CS in an oval. M32) Tower stairs mid-section. Badly eroded names. M33) Tower stairs mid-section. Names HOPLIGHT 1710 etc. M34) Tower stairs mid-section. Initials AP, TN & Date 160-. M35) Tower stairs, upper section. A. Viner over earlier figure of a man. M36) Tower stairs upper Section. A Outred 1875 & various initials + dates. M37) Tower stairs, upper section. Thoragood Oct 7 1860 & initials GH. M38) Nave south wall, between centre & west window. A tiny letter H on plaster. M39) North door, west side. Stone plus various names & initials. M40) Below M409. Various initials. A variety of items were found only once, there is a modern mason mark (O11) but no medieval mason’s marks, apart from the one mason’s location mark noted (O10) on a piece of recovered stone. 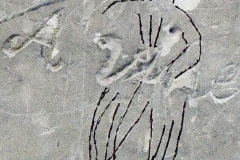 Several carpenter’s location marks were seen and one was recorded (O09) as a specimen. 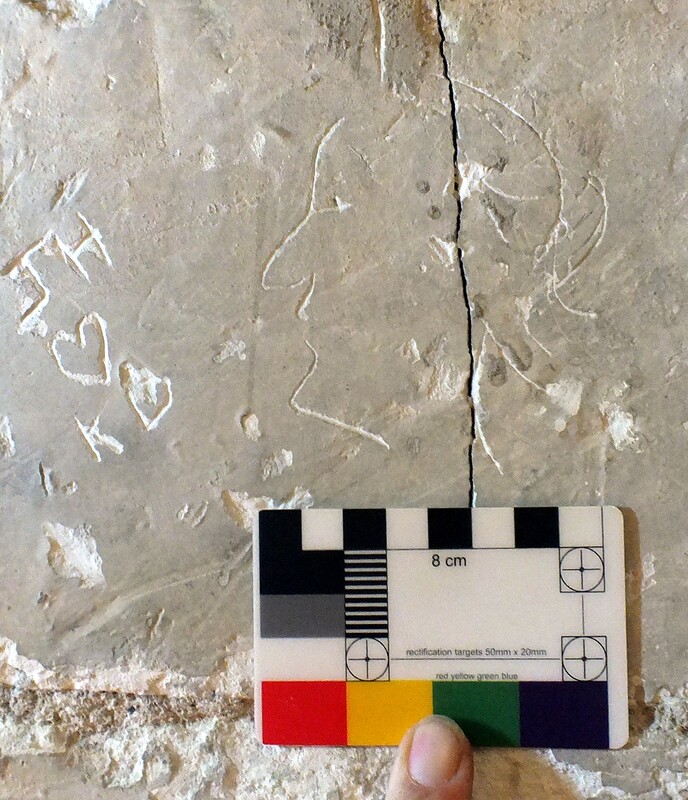 A rarity was the piece of architectural graffiti (O07 & O08) found and recorded for the first time. 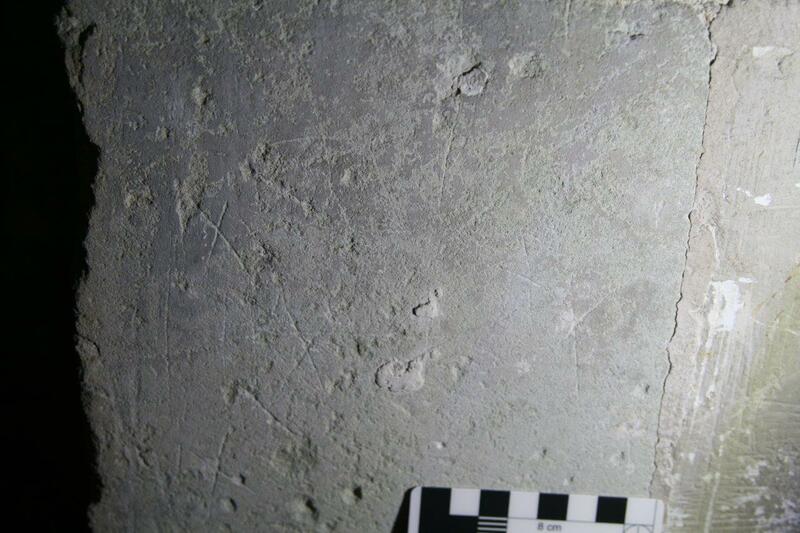 Other individual graffito found only once were the points of a compass (O06), a shield (O04 & O06), a possible merchant mark (O03) and what appears to be a badly damaged anchor O01 & O02). 001) North rectangular pillar, north west face. A possible anchor. O03) South rectangular pillar, south west face. A possible merchant mark. O06) South west pillar, south west side. The four points of the compass. O07) North chancel arch, north face. Architectural graffiti. O09) Ringing chamber ceiling, carpenter's mark. O10) Ringing chamber. A mason's location mark on a piece of reclaimed stone. O11) Tower stair, upper section. The mark of a modern mason D. POVEY 1988 MASON. Three pieces of what appear to be medieval script were found and each seemed to be single words. As is usual with the examples seen by the author, these are illegible. 1) South rectangular pillar, west end. Indecipherable script. 2) 1st circular pillar west of north rectangular pillar, west side. A small piece of indecipherable script. 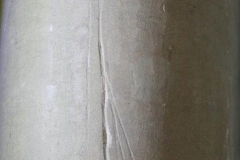 3) South aisle west pillar. Possibly a single word of script. Several items were found that are either unidentified or might have more than one purpose. These include a possible Merchant mark (UA09), indecipherable faint lines, a possible tally (UA03), a possible sword (UA05 & UA06), one very odd shape (UA10), a possible set of scales (UA11), a possible anchor (UA13) and what could be the remains of a foliate design (UA14). UA01) North rectangular pillar, north west side. 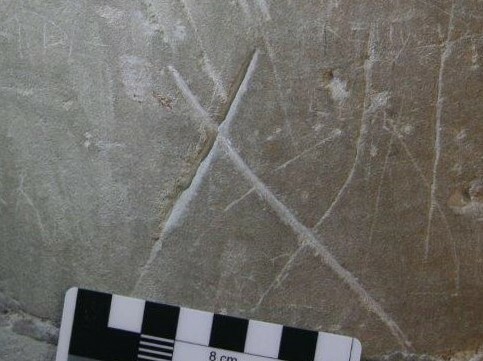 These could be three intersecting apotropaic lines of a thin arrow head. UA02) North rectangular pillar, west side. Faint marks. UA03) North rectangular pillar, south west circular column. A possible tally. UA04) South rectangular pillar, north east face. This looks like a vertical bone with a chisle on its top. Very odd. UA05) South rectangular pillar, south west circular column. What seems to be either a letter J of a falchion (a heavy medieval sword). UA06) UAO5 Enhanced to show the hilt of the falchion. UA07) South rectangular pillar, west circular column. Various lines near the base. UA08) South rectangular pillar, west circular column. Various marks. UA10) Tower stairs, below ringing chamber. A very odd shape. UA11) Tower stairs, near the bell chamber door. An inscription which looks something like a set of scales. UA12) Tower stairs, upper section. 9 & I which seem to have been produced at different times. UA13) Tower stairs, mid-section. Possibly an anchor or an add J, perhaps even a T with a curve under it. UA14) South nave wall, between centre & west windows. 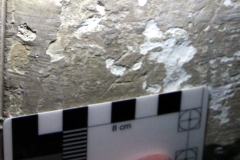 An odd mark in plaster, possibly part of a damaged floriate design. 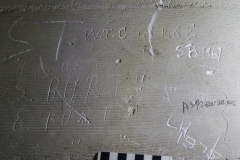 This church was found to contain a wide variety of graffiti, some were rather strange and unusual, such as UA04 and UA10. While CD08 to CD11 are a design I have only seen as part of the decoration on tombs. 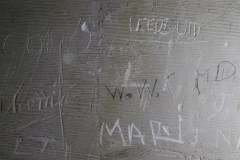 The amount of modern graffiti found in the church, especially in the Tower, came as something of a surprise. 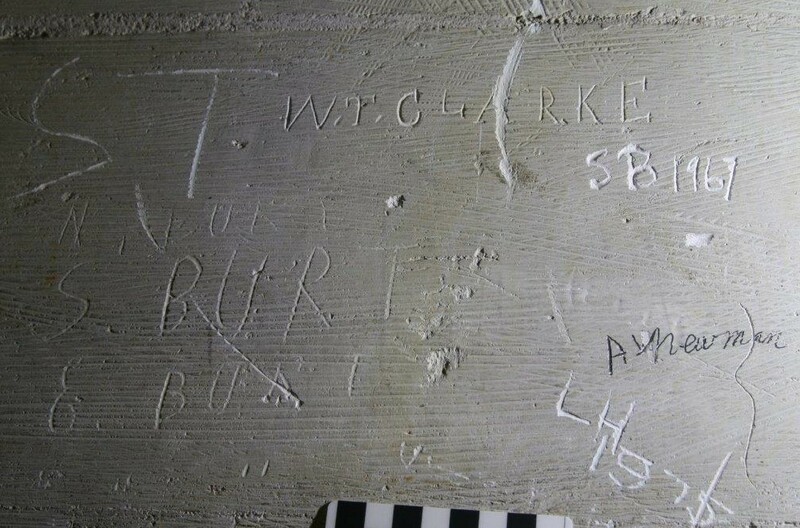 However, none this graffiti was markedly different from what is found elsewhere, apart from the quantity found. 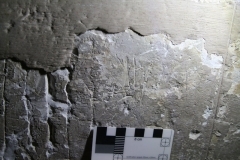 One piece of relatively rare graffiti was found, this was O07 & O08, a minor piece of architectural graffiti found by the author on a preliminary visit to the church. This was verified by Matthew Champion as being both architectural graffiti and previously unknown. The latter coming as something of a surprise to me. All in all this is a lovely church with a lot of graffiti and some surprises.